I just want to say "Hello" and welcome to my regular readers as well as anyone linking over from Sew, Mama, Sew's May Giveaway Day. I am very excited to be participating in this fun giveaway. Bloggers across the internet are giving away homemade items this week. 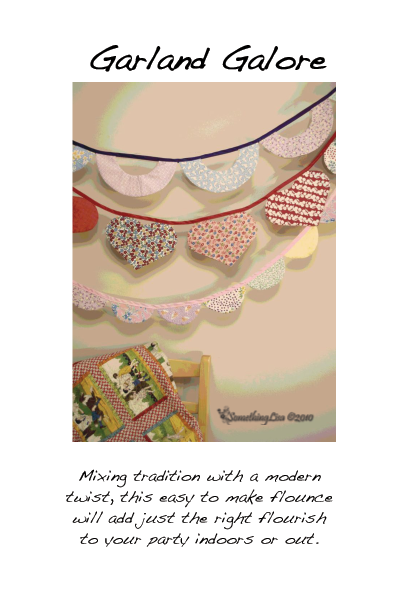 as well as a copy of my pattern "Garland Galore" which retails for $9 (US). If you would like an opportunity to win these two prizes please leave a comment telling me what is your favorite thing to do in the Summer. The contest will remain open through Midnight (central time) May 20th. I will use a random number selector to pick a winner from the many comments and post the winners name on my blog May 21st. Please make sure I have an email address to contact you either through your profile or in your comment. or at Whimsy Cottage, located in Holladay, Utah. I am approving all comments before they post so don't worry when your comment doesn't show right away. I will see and read EVERY comment! Thanks for stopping by and Happy Giveaway! i love the garland. i have just the spot it will go too. summer places: hikes, and camping. My favorite thing is camping and campfires! Hey--this looks like a super fun giveaway! Count me in! Great garland. Thanks for the chance to win. In the summer I love to swim at the pool with my kids. Hi! What fab garlands. Things to do in summer....get the barbie out and grow a few veggies to make the salads and veggie kebabs!! Hands down my favorite thing to do in the summer is spend time with family while outside (particularly at the beach) but I'll take anywhere there's sun and water!! I love the garland--my living room is red, white and blue!! I love garlands and the heart one is just very cute! I love the red, white, and blue garland and would adore a pattern. My favorite thing to do in the summer is go to the drive-in theater and tailgate, we still have two drive-ins within drive-able distance of us! Thanks for the opportunity! My favorite thing to do in summer is eat all the scrumptious fresh fruits and veggies! I love summer salads. thanks for the giveaway! What a great giveaway! My favorite thing to do in the summer is go down to the river with all the young cousins and spend the day just soaking up the sun and company! I just told my husband I wanted a red, white and blue garland. Our first born bday is july 3 we love to go to fireworks on the fourth. Hey, I need to make a garland or two...this is perfect! Those are so pretty!! My favorite thing to do in the summer is to swim!! In the summer we like to relax at the Jersey Shore. Thank you for the giveaway! I love the garland, and it looks like it would be fun to try some of the others too. I am loving those garland patterns! My favorite thing about summer? Fresh produce! Especially some juciy cold watermelon! Great Items! My favorite summer thing to do is to sit in my swing and watch my dogs play. My favorite thing to do in summer? Toast marshmallows with the fam in the backyard. Hands down. My niece's 4th birthday is on the 4th of July (come to think of it, her birthday falls on the 4th of July every year...) and I know your garland would make a sweet decoration each year for her party. Fun prizes! We like to go camping as often as possible in the summer. Thank you! The garland is cute! Nice prize. My favorite thing to do in the summer is have BBQ's with my family! What cute garland! I may have to add these to my to sew list. Thanks for the great giveaway! This is great i actually wanted to make some to spice my sewing room and my girls room.. Cute giveaway! That red,white,and blue one would be perfect for when my brother comes home from Afganistan in July! I love summer gardening and hiking and family picnics at the lake. Oooohhh I love garlands, fingers crossed for your lovely pattern :-) My favourite thing to do in summer is sit in the garden with a nice cup of tea with my husband and the boys and watch all the wallabies that come to eat the nice sweet grass in our horse paddock. We have a community of about 20 now and they are great to watch. I've always loved garlands but never tried to make one. That one would look perfect on my porch for the 4th of July and a book on how to make more would be really cool! I love cooking/eating outside in the summer - lets hope we actually get one this year in the UK!! I love to go to the lake and go boating in the summer! One of my favorite summer things is picnics. my favorite summer activity is soaking up the sun! just feeling the heat mind you, i wear lots of SPF...but im always cold and winter makes me gloom and doom, so BRING ON THE SUM! thanks for a hcance. I love the garlands! I hope I'm lucky. My favorite thing to do in the summer has to be going to the beach! I just started making banners. Your patterns are sooo cute! Love them! Our fave thing to do in the summer is camping! I love your garland. And I love to walk through the garden and pick fresh veggies in the summer. I just love being outside-camping, hiking, swimming... I love the banner! Cute American Garland!!! We live in Northern Idaho, so it's not real warm for every long, so we take advantage of the heat and go to the beach pretty much every day. I love the things my kids invent to do there. Cute! We love the beach in the summer. Thanks for the wonderful giveaway! Ohhh Great Prize! In the summer I love spending more time outside and going to the zoo with my girls. I've been wanting to make some holiday garlands for the past couple of years. Thanks for reminding and giving me the nudge. Oh yeah...during the summer, I absolutely love getting up early, before anyone else in the house, and enjoying a cup of coffee on the deck. Whoops - at least you're reading these so you'll see this is my second post, sorry! - I deleted the sentence about my favorite thing in summer - swimming in the lake! And again, the garlands are so sweet. I love camping in the summer and I'm going tomorrow! Lovely garland. hello, thanks for the generous giveaway! come visit my giveaway too at my blog. such a festive one! love it. I love these! I was considering something patriotic to make to hang in the house, what a perfect answer. Either your handmade one, or the pattern would be awesome! In the summer, I like to be cool. The sprinklers at the park are nice for the kids. What we do more often is have a ton of little children over to play inside which gets too loud and the mommies don't get to chat as much as we'd like. my favorite summer thing is growing veggies in my garden, and then eating them! i also love shopping at farmer's markets! thanks for this great giveaway, your garlands are lovely! what is my favorite thing to do in the Summer??? 1)sewing under a tree, 2) sleeping under a tree!! I'm looking forward to some good zoo trips with the kids this summer! My favorate thing to do in summer is swim. I love to sit outside and look at the stars with my husband. In the summer, I love to jump in the pool. I swear I should have been born a mermaid. what a fun giveaway! i would love to be included! thanks!!! how festive! i LOVE them! I love adding garland to the house decor... it just adds such warmth to any room! and summertime favorite... laying out at the beach! picking up shells with my kiddo or going out on the ocean kayak to soak up what beauty nature gave us! I love to watch my monkeys run through the sprinkler, just like I did as a kid. I love summertime picnics! Thanks for entering my giveaway, too! Great giveaway! I've been wanting to make one of these, but haven't gotten around to it yet. I'm just excited to be able to play with my kids this summer. Last summer I was laid up with a herniated disk and had to have back surgery. Cute garland! Thanks for the giveaway. ...your garlands are pure delight and it should be great to win them...I'll keep my finger crossed for it and, in the meantime, thanks so much for this generous chance! Garden! I love tending the garden and reaping the benefits is an added bonus. Your garland would be perfect for July - it's so festive and fun. I'd love to try to make my own with the guidance of your pattern, too! Thanks! My favorite thing to do in the summer is nap in the shade on my patio swing with my little fountain running in the background - so peaceful. I love garlands! Here's crossing my fingers that I win! Thanks for the chance! I love the long days where the kids can play outside after dinner. I love to go to the ocean. We live pretty close but we don't do it enough. Oh my favorite thing to do in the summer is read! I always have a summer reading list. Would love to win this pattern. I can't do anything w/o a pattern! I spend four hours a week in a pickup so I have lots of time to read in the summer. Otherwise I'm sewing (or reading blogs). Thanks for the giveaway! My very favorite thing to do in the summer is sitting on the patio after the sun goes down surrounded by friends and family and sharing the stories of our days over apps and wine. I like having bonfires and toasting marshmallows. They are great if you put one on a LU petit ecolier cookie. (hope I spelled that right, it's a cookie with a layer of chocolate, milk, dark, extra dark or hazelnut) and playing in the sprinklers with my kids. Thank you for the chance to win the garland, it will be great for a 4th of July party! What a cute garland! Thanks for a chance to win! I love the garland. Kayaking is my favorite summer thing. Oh, this is so pretty and so perfect for the holidays! I am excited to check out your garland book! and for the chance to win it too. My favorite thing to do in summer is nothing big, I just enjoy the extra time to play and explore with my kids, and the extra long sunlight hours to sit outside or at the beach on a balmy evening. Oh my goodness. Thanks for sharing.